After the GMT Tourbillon in pink gold in 2011 and the white gold version in 2012, Greubel Forsey is now presenting this exceptional timepiece in platinum. 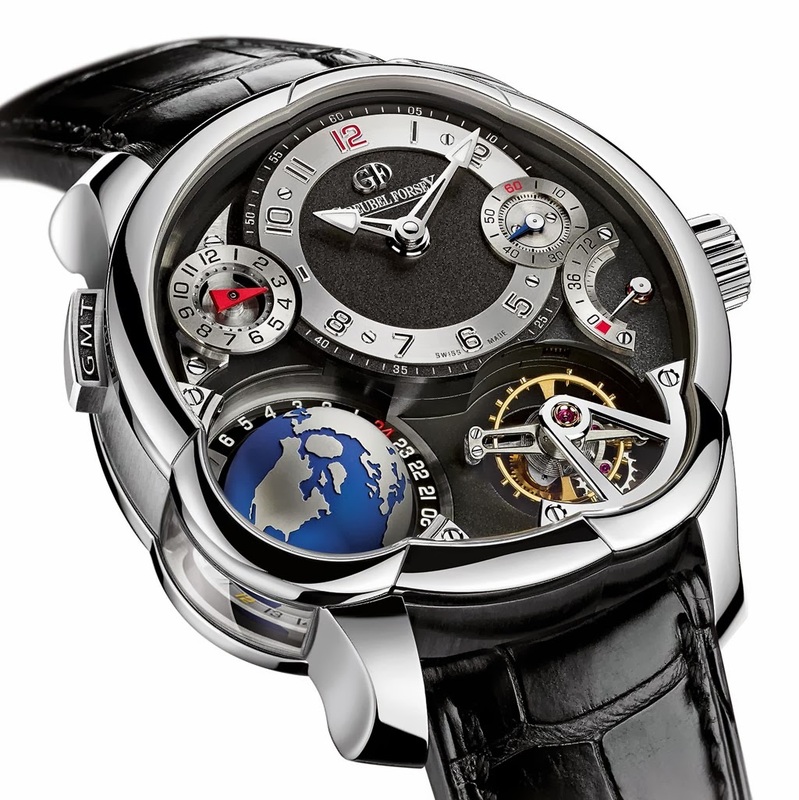 The Greubel Forsey Platinum GMT is a joy for the eyes from any side you look at it with its rotating terrestrial globe indicating the second time zone, the tourbillon with 25° inclination and the universal time indication in the back. The titanium globe completes each anti-clockwise rotation in twenty four hours following the same direction in which our planet spins. This planisphere presents the global time zones from the perspective of the North Pole where they converge. A lateral window set in the case offers a viewpoint over the Southern Hemisphere. The South Pole does not appear since it is the anchor point of the globe, which houses a “flying” pivot system. The inclined tourbillon completes a rotation in 24 seconds and comprises 87 components for a total weight of just 0.36 grams. 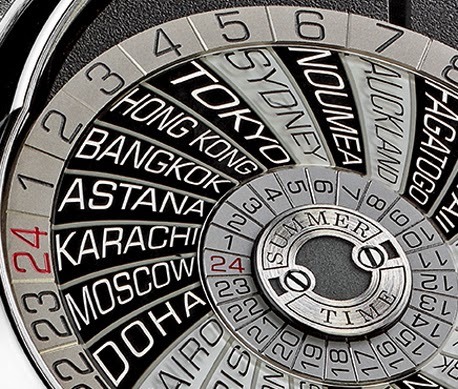 The back of the timepiece displays universal time for 24 time zones through a rotating disc bearing the names of 24 cities and providing indication of summer time for cities which follow this system. 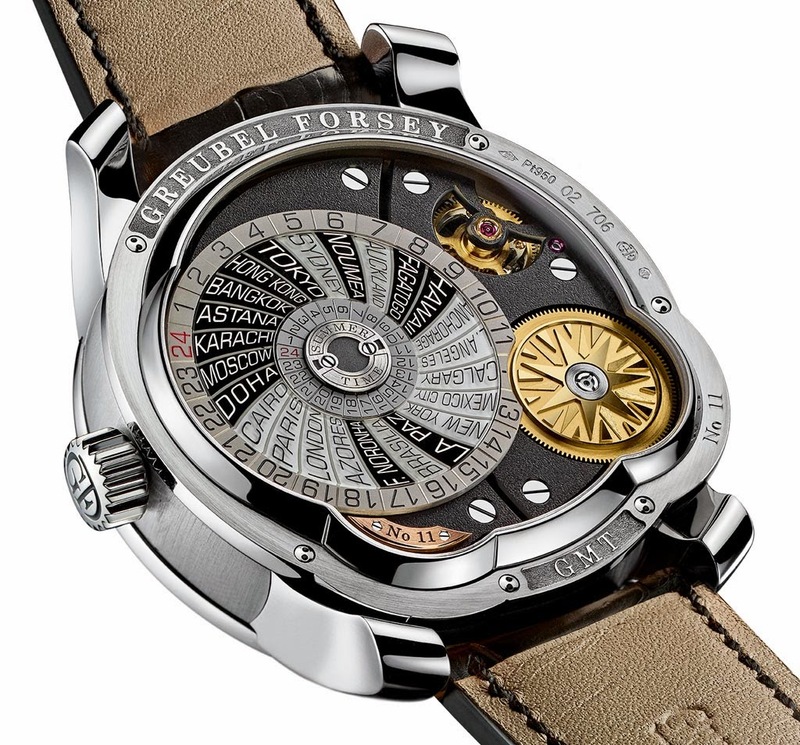 A symbolic midday sun at the zenith of the world time disc illuminates the case- back. Made from 950 platinum, the new Greubel Forsey Platinum GMT has slightly lighter hue than the previous white gold version and features a gold, frosted, black chrome treated dial which creates a truly beautiful effect with the contrasting polished and satin-brushed white gold surfaces. At 2 o'clock we find the small seconds sub-dial and then a sectorial power reserve indicator at 3 o'clock. At 10 o'clock is the GMT display for the second time zone. The case is 43.5 mm wide with a total height of 16.14 mm. The GMT calibre GF05, comprising 443 components and beating at 21,600 vibrations per hour, is powered by two coaxial series-coupled fast-rotating barrels providing a 72 hours power reserve. 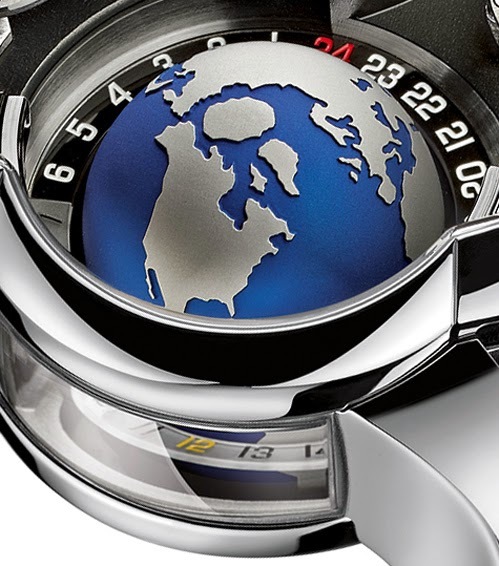 The hand finishes of the Greubel Forsey Platinum GMT take in the entire range of traditional techniques, from frosting to hand-bevelling, as well as the subtleties of hand-polishing, lapping, and straight graining with flat black polished finishes. The domed crystal, the case-back and lateral window are made from sapphire crystal. The hand-stitched black alligator strap has a platinum folding clasp. After the GMT Tourbillon in pink gold in 2011 and the white gold version in 2012, Greubel Forsey is now presenting this exceptional timepiece in platinum. 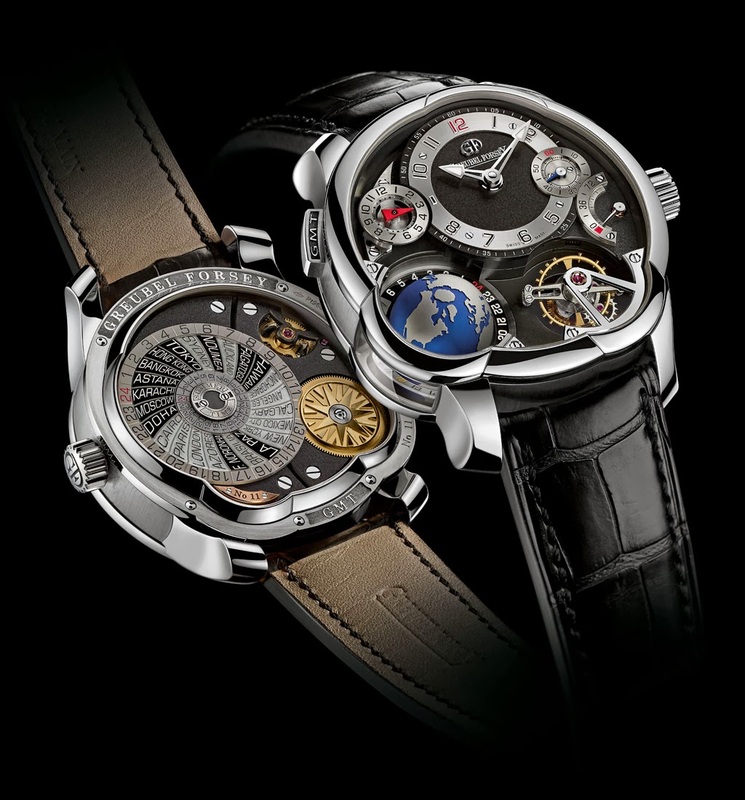 The Greubel Forsey Platinum GMT is a surprise for the eyes from any side you look at it with its rotating terrestrial globe indicating the second time zone, the tourbillon with 25° inclination and the universal time indication in the back.